When you hear the word Cartier you think of luxury, class, and of course timeless style. One of the oldest and most established jewelry and watch brands in the world, Cartier almost always shows up on the red carpet. Whether it's a classic gold watch on a Hollywood hunk, or the perfect diamond stud earrings on an A-List starlet, everyone in the biz knows you can't go wrong when accessorizing with Cartier for big events. When superstar Renee Zellweger attended the premiere of her film Leatherheads in Los Angeles, she opted for this stunning Cartier onyx and diamond ring. Paired with a navy blue chiffon dress by Carolina Herrera, and sparkling gold pumps, who needs another accessory? A statement accessory on the red carpet is a must, and Renee made the perfect choice. Keeping her style simple, but unique at the same time, there is no way Renee will end up on the Worst Dressed List! While there will always be the classic little black dress and eternally stylish Cartier watch, choosing to wear a classic designer, but selecting a more bold style is a great way to show your own personal style. Pairing this fabulously chunky Cartier ring with a more demure navy dress lets the ring really be the star of the ensemble. 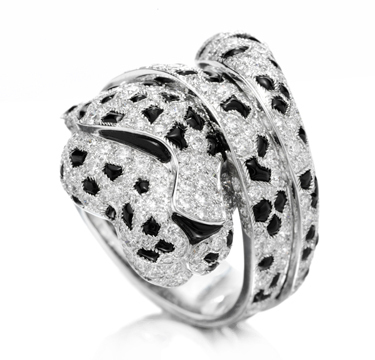 Featuring panther onyx and seemingly endless shimmering diamonds, this unique ring is truly and eye-catcher. With a price tag of almost $100,000, we can only hope Renee got more use out of this ring than just one night on the red carpet! When styled in the appropriate way, Renee could really wear this fantastic ring anywhere. It would still look great with a pair of sleek black trousers and blouse at another event, or even jeans and a cropped jacket for daytime. Although it's a big, statement piece, this ring is still versatile enough to pair with just about any outfit. They key is not to over-do it with too many other accessories. If you have a statement piece, keep it simple, and let the item speak for its self! Think you're ready to make a statement with this gorgeous Cartier ring? Time to turn on your webcam, and practice your best wave to the paparazzi with ViewTry!